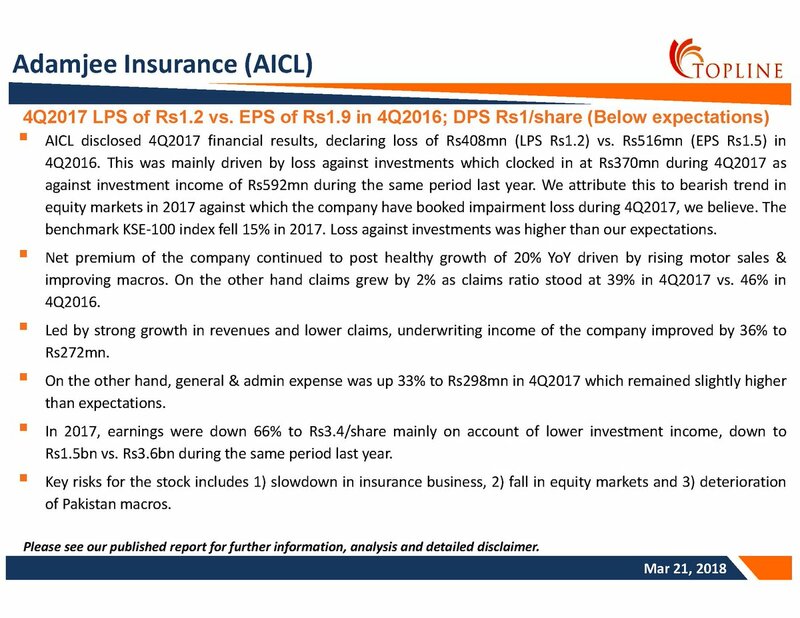 We reiterate our 'Buy' rating on Adamjee Insurance (AICL) with a revised Target Price of Rs76 (Rs83 previously) as we update our investment case on the stock. We flag the company's portfolio accounts for 50% of its valuations, where MCB Bank (MCB) alone accounts for 24% of company's total valuations. In 1Q2018, AICL's net earnings clocked in 3% YoY lower at Rs1.89/share. However, Underwriting profits witnessed 34% YoY increase on account of higher Net premium and improving Net Claims ratio. 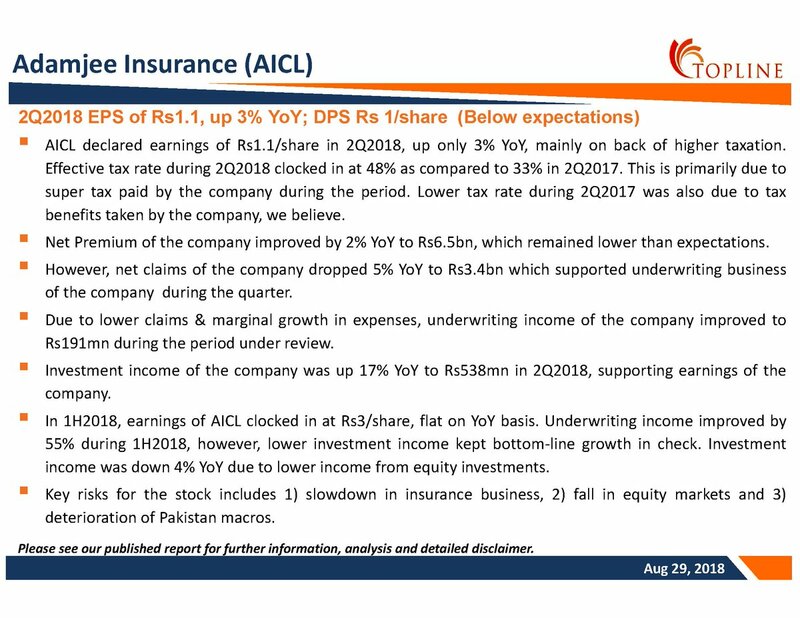 On Investment income front, AICL's dividend income declined by 30% YoY, taking overall Investment income down by 21% YoY. We value Adamjee Life Assurance Company Ltd at Rs28 under relative valuation method, where AICL stake adjusted value computes to Rs21. Ab khud soocheay Kiya faida idhar with holding power? Ba halat e majbori for short term hold Karo aur jaisay hee nafa dikhay Baich daii.. If you are still holding Ferozsons then what about average @ current rates ? 700 kar do sara loss recover. Aharoon 700 jaye ga kya ? Dost Bilkol Jai ga inshaAllah bilkol Jai ga 700+ In 2 to 3 years..
IMF Pakistan ko dollars issi wajeh se nahin dai raha Kay IMF ko andaza hai kay in future US Dollar Pak Rupee Kay against bohat weak na sahi lekin strong hota bhi dikhaee nahin dai raha..aisee soorat Mai IMF ko apnay dollars Kay against sirf interest to mil sakta hai lekin Capital Gain nahin milnay Wala..Goora Capital Gain Kay baghair investment Mai interest nahin laita..
Pakistan Kay liay 2021 takk ka period uski economy Kay hawalay se kafi tough hai magar jaisay hee CPEC operational hoga aur CPEC see cash inflow start hoga Dollar bhi cheap hoga aur apki country ke economy bhi bohat behtar hogi inshaAllah..jaisay jaisay apka rupia stable and strong hota jai ga waisay waisay Pharma Sector Kay margins increase hongay .. Yes agrer with you if pak rupee strengthened against usd pharmaceuticals will rock, khyan 22% NP margins se below 5% now. 2 se 3 saal mei agar Feroz 700+ ho jaye ga In Sha Allah if PKR/USD comes below 125. As per a stock exchange filing, Adamjee Insurance (AICL) has increased the ownership of its unlisted subsidiary, Adamjee Life Assurance Company, to 100.0% from 74.3% previously. These shares were acquired from its partner IVM intersurer BV. Ferozsons never gave bonus shares during last 6 to 8 years atleast.